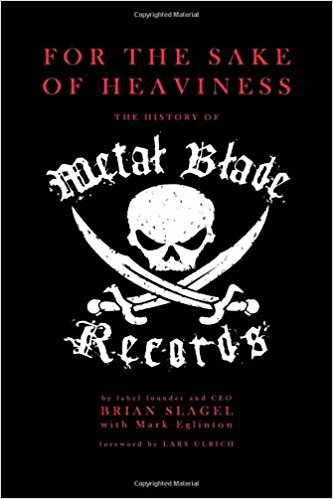 For The Sake of Heaviness: The History of Metal Blade Records, is a story of a record label that survived thirty-five years and it is a great read for anyone interested in music regardless of how you may feel about heavy metal. Brian Slagel clearly has “the bug” when it comes to music as I suspect do many readers of the Big Takeover. This is a well written, enjoyable book, summarizing the history and impact the independent label had on establishing heavy metal across the US and globally. The other reason it is highly recommended is that it goes beyond just a historical document and offers a fresh perspective on the merits of the genre of extreme. Whether you are a fan or not, any music lover will enjoy to hear how a guy with the bug was able to turn into it a dream come true, all with a very small, family-oriented organization. The heart of the book is the full history of the genre, it’s golden years [the 80s], the tough years [90s] and the present resurgence where Brian eloquently explains, “there was no doubt heavy metal needed to go back underground to reinvent itself, and that’s what it gradually did.” Through thick and thin, the Metal Blade label stuck to their own philosophy, only putting out records they enjoyed and those which it felt needed a wider audience. They avoided the pitfalls of releasing records based on trends. I will avoid going into too many details as the history is better heard through Brian and co-author Mark Eglington’s words but as many are already aware, it started as a fanzine and compilation of bands little known outside of L.A. starting in 1982. This ultimately transformed into a label “simply” because many of these bands had no home for full lengths and EPs. As with other great genres, it all started underground with influences from what was happening in England combined with the harder bands which had formed in the 1970s. Mix this together with some punk influences and the early days of this label is an incredible story. When you look through the roster of bands he in some respects discovered, guided, and allowed artistic freedom it is quite impressive: Metallica, Slayer, Voivod, Armored Saint, Lizzy Borden, Cannibal Corpse, Corrosion of Conformity, D.R.I., Flotsam and Jetsam, GWAR, the Goo Goo Dolls, Amon Amarth, and the list goes on. When moving into the subgenre, death metal, I felt he may have been speaking directly to me: “It’s funny, because a lot of people my age aren’t into it [death metal] So many people in their forties and fifties say to me, ‘I just can’t get into it. I can’t deal with the vocals.’ Part of me totally understands that; it’s a whole different thing from traditional metal. But, for me, it works precisely because of how the evolution of metal unfolded. As music was getting progressively heavier, bands were finding it difficult to do anything heavier with the vocals. Then, when death metal vocals came in, everything changed. What could be heavier than crushingly heavy music with those guttural vocals?” As one of those people he is referring to, I cannot argue with his take on death metal and now after reading this, I will revisit some of my own earlier failed attempts to enjoy it. The entire history of Metal Blade’s evolution, partnering with a major label then going independent again, its foray into punk releases, comedy, and sports/ metal radio shows and the authors’ pontifications on the genre make this book worthy contribution to the history of music. Pick it up, read it, then either dig through your dusty vinyl or download as needed but be sure throw your horns in the air and re-emerge yourself in the gems that often get lost in the history of metal.